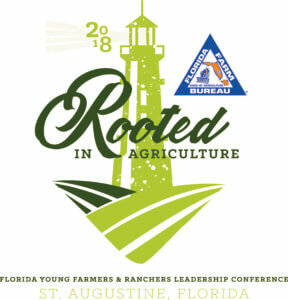 We are excited you have decided to join us at the 2018 Young Farmers and Ranchers Leadership Conference in St. Augustine, July 13–15, 2018. This year’s YF&R Conference will offer more breakout sessions and opportunities to learn about various topics affecting agriculture enterprises. The Conference will also feature the preliminary Florida Farm Bureau Discussion Meet. This year’s theme is “Rooted in Agriculture” and we’ll see you in St. Augustine!